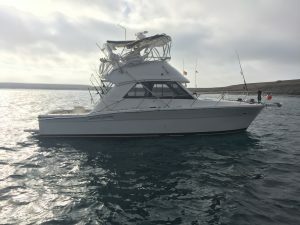 Ventura Captains overheard a distress call from a 38 foot power boat disabled and drifting near the western tip of Santa Cruz Island. 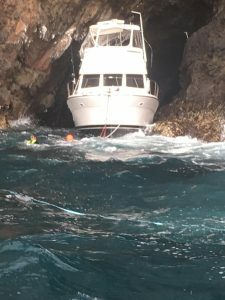 Shortly after, radio traffic advised that the vessel had gone up onto the rocks where a good samaritan vessel, Coast Guard helicopter, and National Park Service were recovering the three survivors from the vessel and water. 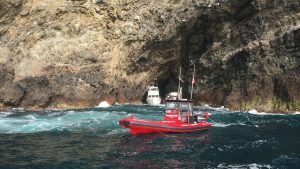 TowboatUS Ventura’s Captain Paul and Captain Carson responded aboard the fast-response boat Retriever, an 8m aluminum hulled inflatable boat, for the 35 mile trip to the scene of the accident. Upon arrival, the vessel was observed still in one piece, but against the rocks posing a significant risk for a hull breach, leading to the sinking of the vessel and the negative environment impact to the Channel Islands National Marine Sanctuary. Carson into the water as the swimmer. 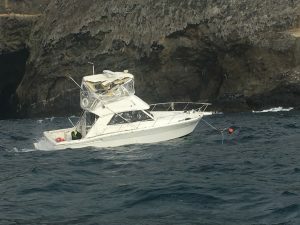 He was able to successfully attach a tow line to the vessel while dealing with the wave action against the rocks. The Captains were able to pull the vessel from the rocks and safely bring it back to Ventura Harbor with no further incident. -24 hours a day, TowBoatUS Ventura offers full towboat and salvage services to the mariners of the Santa Barbara Channel. As a member of the Accredited for Commercial Assistance and Professional Towing (ACAPT) program, you can be ensured that we will provided the highest levels of service.